NORTH ANDOVER, MA, December 6, 2016 -- JENSEN Tools + Supply, an industry-leading provider of electronic tools and services to professionals in the electronics manufacturing industry, recently announced the introduction of new features that will make the purchasing journey of its customers more convenient and efficient. 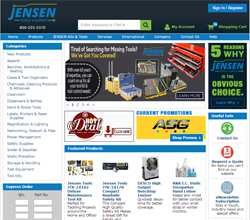 The recently revamped website of JENSEN Tools + Supply boasts a new and improved sign-in and shopping cart layout, as well as a new section, JENSEN’s Value Proposition. JENSEN Tools + Supply, being a renowned and trusted name in the industry, has been providing e-commerce services to its customers for a long time now. To further add to the users’ experience of JENSEN’s website, the company recently upgraded its website. When asked about the recent website upgrade, John Weetenkamp, General Manager, JENSEN Tools + Supply said, "At JENSEN, our aim is not only to provide innovative, high-quality solutions to our customers, but also to make their online shopping experience as seamless as possible. Therefore, upgrading our shopping cart and sign-in page to improve our users’ web experience was a pressing priority for us. These website enhancements and new value proposition are closely aligned with JENSEN’s strategic vision for customer-centric, value-driven corporate directions." The recent enhancements made to the e-commerce website of JENSEN Tools + Supply will not only offer an improved experience to customers, but will also provide benefit to other stakeholders, including JENSEN’s employees and strategic partners. Dan Sinclair, Director of Sales at MicroCare Corporation, a strategic partner of JENSEN Tools + Supply, said, "JENSEN’s newly redesigned website will provide a satisfying user experience for customers, staff, and especially, strategic partners like us. The latest web enhancement release is another big step in expanding JENSEN’s forward thinking and customer-oriented digital initiatives." JENSEN also added a new section to its website titled ‘Value Proposition’ which will help customers understand why they should choose JENSEN as their preferred provider. The newly unveiled page of JENSEN’s website can be found here: www.JensenTools.com. The latest shopping cart enhancements made by JENSEN Tools + Supply can be explored at JENSEN’s online shopping site: www.JensenTools.com/sign-in.aspx.